By now most of us have heard the terms “Bitcoin” and “Cryptomining”. Whether you’re nose deep in investing in cryptocurrency or these are merely buzzwords filling up your newsfeed, this formerly obscure form of currency has hit our mainstream culture. But did you know the hidden dangers of this new trend? In the last year, cryptomining has become an increasing threat to enterprises, with mining software threatening millions of endpoints—and counting. If you haven’t jumped on the cryptocurrency bandwagon, this trending form of digital currency is popular for its anonymity. You can make transactions or transfers with cryptocurrency without leaving behind a trackable trail thanks to cryptocurrency’s cryptography technique. This technique converts legible information into a code that is nearly uncrackable. Throughout the years, cryptocurrency like Bitcoin and currencies built on Ethereum have become a popular investment for individuals looking to make a quick fortune. One of the ways they do this is through “cryptomining”, which is the act of using CPU resources to verify digital transactions made by cryptocurrency. The better the processing power, the more transactions you can process, and faster. Sounds great, right? So how is this impacting businesses and enterprises? It’s a good question, and one that is important for your digital security. Malware is a well-known enemy to computers and computer systems both at home and within a business setting. Hackers have a subtle way of hiding this software within seemingly harmless downloads, infesting computers and gaining access to sensitive data or computing functions. 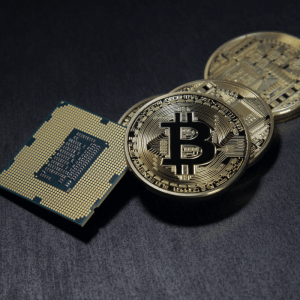 Cryptominers are now using malware to take advantage of businesses with a promising amount of computing power that they can utilize to process cryptocurrency transactions. It only takes a single breach on a single local admin login for a hacker to access an entire network of desktops. This is typically done using botnets: malicious software that controls a network of private computers without the owner’s knowledge. This kind of activity can be difficult to detect, which is why proactive cybersecurity is important. But what if the breach is coming from the inside? While the idea of doubting our own staff members can be unsettling, there have been cases where tech-savvy staff members who have access to company computers and networks choose to run cryptomining applications outside of business hours. So what’s the harm? The intense computing these applications generate have led to spikes in utility bills due to the power needed to run the hardware, as well as the AC running harder to combat the heat created from these hardworking computers. There are a few things you can do, including monitoring your end point system performance as well as tracking your CPU cycles and traffic spikes. Being more vigilant about your computer’s and network’s activity can tip you off on suspicious activity and help you catch malware or breaches early on. However, as we stated before it’s important to have a proactive approach to cybersecurity. Don’t wait for a problem to arise to defend against it. If you would like to learn more about anti-virus and anti-malware services as well as how you can improve and protect your enterprise’s servers and security, talk to us at 239-403-2950 or email Skylink via our contact page.